How big is the village? Which services can be found? What kind of wild life is possible to find in Peninsula Valdès? Which activities can we do in town? How many days are recommended to spend in the area? Que cantidad de días de estadía son recomendados para un máximo aprovechamiento del destino? Where is located Puerto Pirámides? How do I get to the village? Puerto Pirámides is the only village within Peninsula Valdes, and is the only natural port allowed for whale watching trips by boat to see the Southern Right Whale. 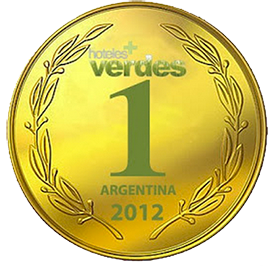 Is located 180 km from Trelew, and 100 km from Puerto Madryn. Schedule usually changes. Feel free to contact us to check it. Puerto Pirámides is the ideal start point to depart to natural places that Peninsula Valdes has to offer you. 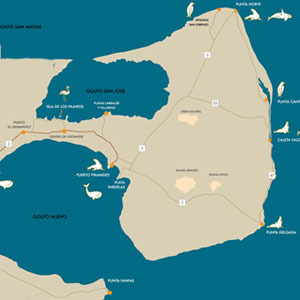 From here you will find unbelievable places starting by Puerto Piramides, Panoramic stops, Playa Pardelas, Caleta Valdes, and much more. The closest place that you will find as soon as you get into the Peninsula is the Istmo Carlos Ameghino, where is located a kind of museum which provides all the information you need to start the adventure. Near we have the signs that indicate the way to Isla de los Pajaros (bird´s Island), called like that because hundreds of birds make their nest there every year, and some other come for feeding: Gaviotas Cocineras, Biguás, Gaviotines, Flamencos, Pato Vapor, Ostreros Negros y de cuello blanco. Puerto Pirámides rests over the Golfo Nuevo, from where we can get to Playa “las Cuevas” and even more, you can get to the Loberia (place where you can see sea lions), 6 km walking trough an upside-down way along you will see amazing landscapes. Already going into the Peninsula we have a pebbles beach called Punta Pardelas. During whale seasons is possible to see them from the coast, and in summer don´t forget the snorkel…its waters has a great visibility. Inside the Peninsula Valdes there are 4 places to visit along the coast, from north to south we have Punta Norte, Caleta Valdes, Punta Cantor y Punta Delgada, where beside the gorgeous and no-ending landscapes, depending of the season you will see different animals. Which activities can we do in town? All the activities are extremely related with nature, especially with the sea: trekking, diving, snorkeling, kayak, whale watching, boat trips, photography, and an activity that few people appreciate: relaxation and the abstraction from the material world! Even we said that Puerto Pirámides can be walked side to side by walking, to go around the Peninsula is recommended to have a car, because there is no public transportation to go there. 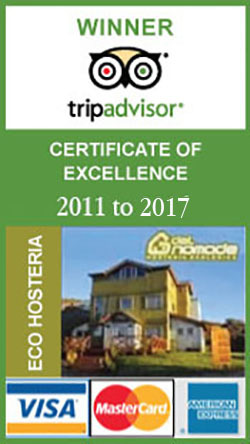 If you don´t want to come or rent a car the choice is to hire a transfer or join a travel agency tour. Bring enough cash with you. Even there is an ATM in the village, it s usually out of service. Also most of the shops and hotels do not accept credit cards. · Suitable clothes are recommended, in winter temperature is cold and it is usually windy. In summer weather is really warm, but at nights you will always need a jacket. · Is important to know that all the activities linked with the sea depend on the weather, that´s one of the reasons because we recommend 4 days in Peninsula. For example, it will be not the same experience to have the choice to choose the day to do a whale watching, that do it certain day with a ruff sea cause we “have to” leave. Remember that we are experimenting nature, and fortunately we can not manage it by a remote control. · Other thing to know when you estimate tour times is that the Peninsula road is made by pebbles, and that is the reason because every way will take you more time than trough a pavement road. From our point of view, as travelers, nature lovers and knowing the Peninsula, the time we suggest to have a full experience is about 3 nights/4days. Are requirements to know or be prepared to learn how to enjoy nature; tranquility, know how to live without advertising and commercial stimuli, TV, the tuxedo and the high heels. In our opinion is good to spend 4 days and 3 nights to get a deeply knowdedge *of the area*. Here as a proposal you have different activities combination and duration. Prices are orientative. 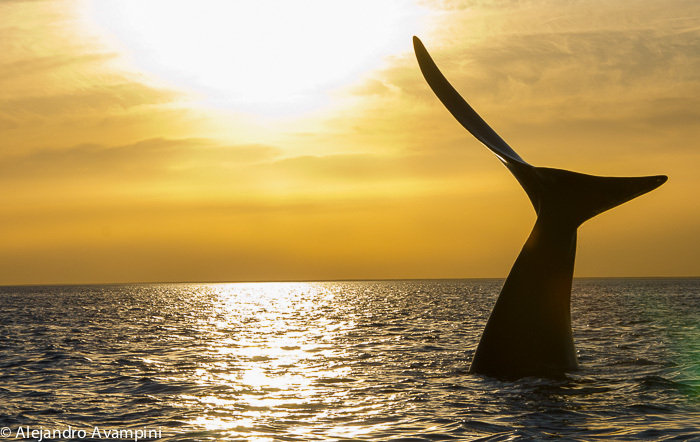 WhaleWatching Trips during the sunset Duration: 2 Hs. Pinguinera, Duration: 4 Hs. Distancia: 150 kms de ripio ida y vuelta. 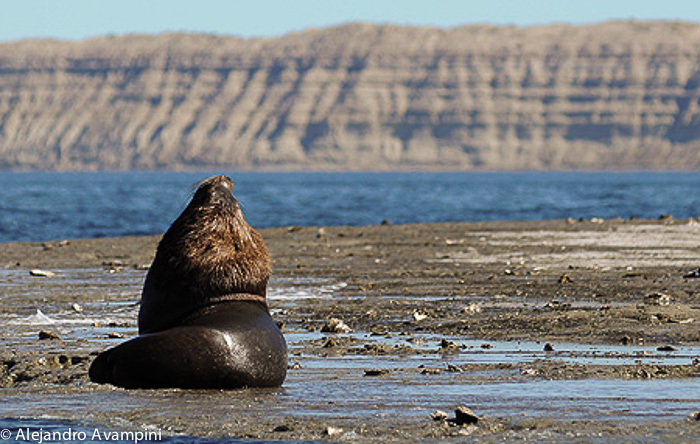 What kind of wild life is possible to find in Peninsula Valdes? Every year the transparent waters surrounding the Peninsula are visited by these amazing creatures for their reproduction.The sociable nature of this species often turns whale watching into a unique encounter between man and whale. Don’t miss the opportunity! 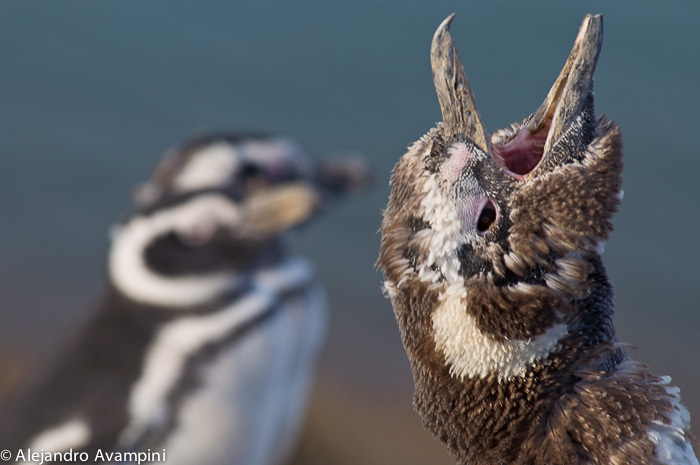 along the coast of the Valdes Peninsula which convert into reproductive colonies each year as of December. 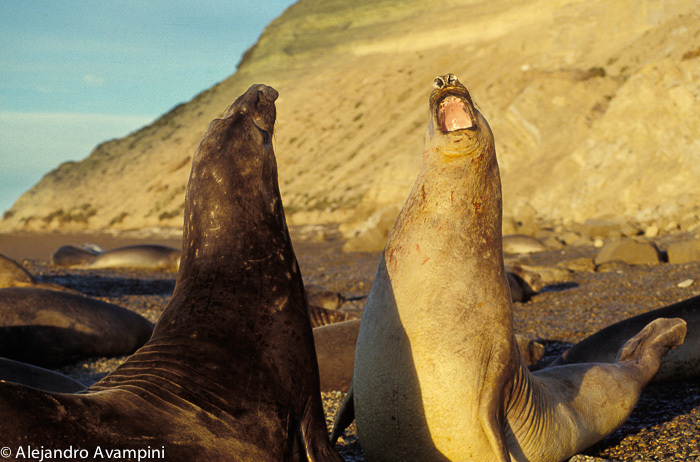 The Piramid Point Sea Lion Colony can be reached in a matter of minutes from town and is a healthy hour walk. Orcinus orca The Orcas of Valdes have adopted a unique and amazing method of hunting in the capture of both sea lions and elephant seals. Intentionaly stranding themselves on the beach, taking more than half of their bodies out of the water, catching their prey and then returning to the sea with energetic movement. Lagenorhynchus obscurus Travelling by boat over the bays and coasts near Puerto Pirámides it is common to encounter groups of Dusky Dolphins, the most common of the dolphins that visit these waters. 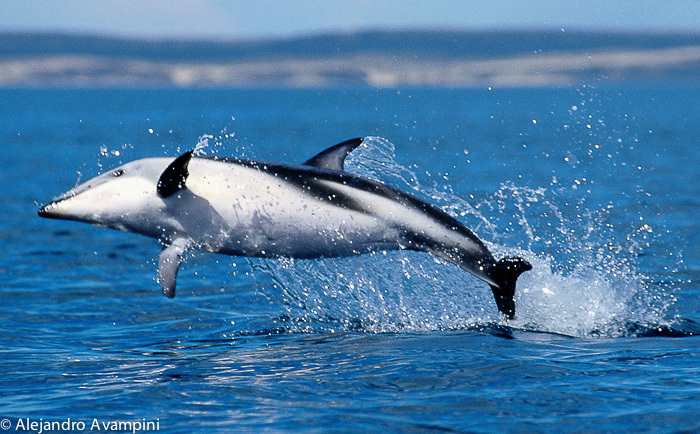 Dusky Dolphins are seen with regularity in both the Golfo Nuevo and Golfo San Jose. There are more than 180 different species of birds observed in the Peninsula Valdes. Among these speciesare the Kelp Gull, Blue Eyed Commorant, the Great Grebe and Snowy Sheathbill. 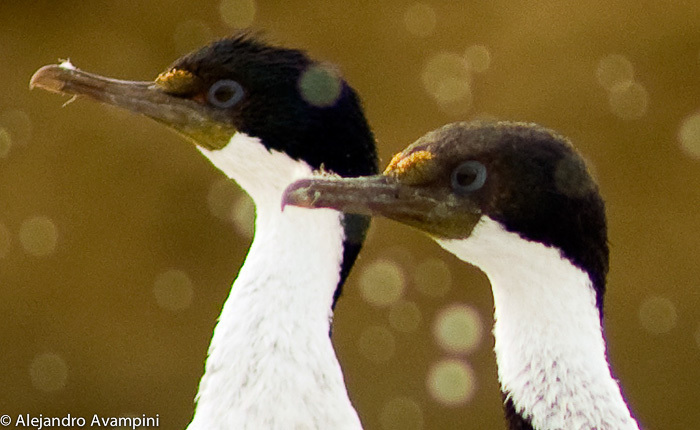 Bird Island on the shores of the Golfo San Jose is a favorite nesting ground for many of these local species.